Veličina ovog prikaza: 549 × 599 piksela. Ostale razlučivosti: 220 × 240 piksela | 440 × 480 piksela | 550 × 600 piksela | 704 × 768 piksela | 939 × 1.024 piksela | 2.209 × 2.410 piksela. 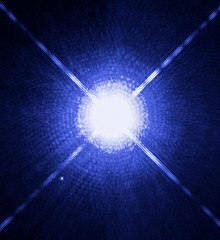 English: This Hubble Space Telescope image shows Sirius A, the brightest star in our nighttime sky, along with its faint, tiny stellar companion, Sirius B. Astronomers overexposed the image of Sirius A [at centre] so that the dim Sirius B [tiny dot at lower left] could be seen. The cross-shaped diffraction spikes and concentric rings around A*, and the small ring around Sirius B, are artifacts produced within the telescope's imaging system. The two stars revolve around each other every 50 years. 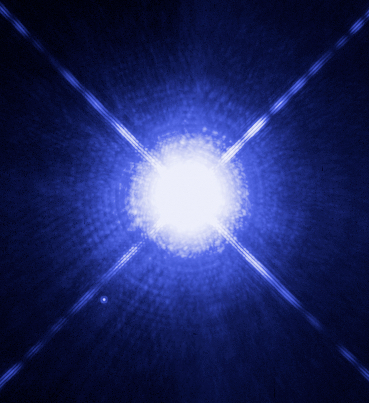 Sirius A, only 8.6 light-years from Earth, is the fifth closest star system known. The image was taken with Hubble's Wide Field Planetary Camera 2. 00:06, 29. kolovoza 2009. 369 × 403 (143 KB) Tryphon Reverted to version as of 12:42, 25 December 2005: original size; anything bigger is just blown-up from this image.